Jonathan K. Rice, originally from Indiana, grew up in south Florida, and presently lives in Charlotte, North Carolina with his wife and family. He received his Bachelor’s degree in Religious Studies from the University of North Carolina at Charlotte, and also did graduate work at Erskine Theological Seminary and Gordon-Conwell Theological Seminary at Charlotte. 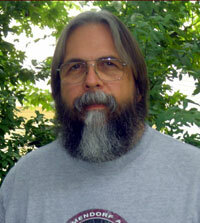 He is the editor and publisher of Iodine Poetry Journal, which he established in 2000. 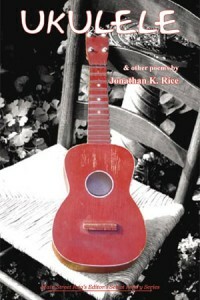 He co-edited the anthology,Celebrating Life, with Lynne Payne in 2002, and authored his first chapbook, Shooting Pool With A Cellist (Main Street Rag, 2003). His poetry has appeared in many periodicals. He has also hosted regular poetry readings in Charlotte since 1999.
he noticed the day before. an expanse of bushes and grass below. surround the clearing before him. branches that break his fall. and had not read or responded to it as yet. to those of you interested in my magazine. however, please feel free to submit this work elsewhere. contributions should be made to your favorite charity. My wife can barely afford to bury me. You’re lucky enough to get this letter. using the seashell ashtray he bought in Key West. the letters from his wife, the hope and consolation. but they don’t write or call each other. but things are looking up, he says. a teapot at a yard sale for the Elk’s Club. as he sorts through bills and ads. and he’s still paying for her funeral. Be the first to review “UKULELE and other poems” Click here to cancel reply.